Long, long ago, in the places we now know as Sograt Desert and Dayr Desert, existed a large and prosperous empire. This was the Solvive Empire, which was ruled by the just and attentive Osiris. Outsiders brought their own beliefs to Solvive, including the two sects known as the Synod of The Dawn and the Twilight Vanguard. These sects worshiped different goddesses. The Synod of the Dawn gave devotion to Sol, the one who bore the heat and the light of day for Midgard. The Twilight Vanguard worshiped Nott, the goddess of the night and darkness. Members of both sects provided animal sacrifices to their goddesses, praying that these offerings would strengthen their chosen deity. Members of the opposing sects were in conflict. The sects fought for their own interests, for longer days or nights. Growing tired of these incessant conflicts, the Solvive Empire ordered both sects to be banished from the kingdom. The Synod and Vanguard were cast from the desert, but the countless statues sculpted in honor of their goddesses left an indelible mark on the landscape. Centuries have passed since the reign of the Solvive Empire, and little has changed. Decades before Surt escaped his seal in Morroc, there was an event that was marked forever in history. For weeks, the night did not appear in Midgard. Historians refer to this period as the "Neverending Sun". Wilted by the endless days, the Synod of The Dawn took responsibility for the neverending sun and proposed a peace agreement with the vanguard of Twilight. The group leaders at the time, Raymond Bazerald for the Synod and Azoth Hinori for the Vanguard, agreed that they would cease their fighting and would dedicate themselves to returning the balance between night and day. In the time after this accord was struck, the nights days and nights have returned to normal and both sects have existed peacefully. 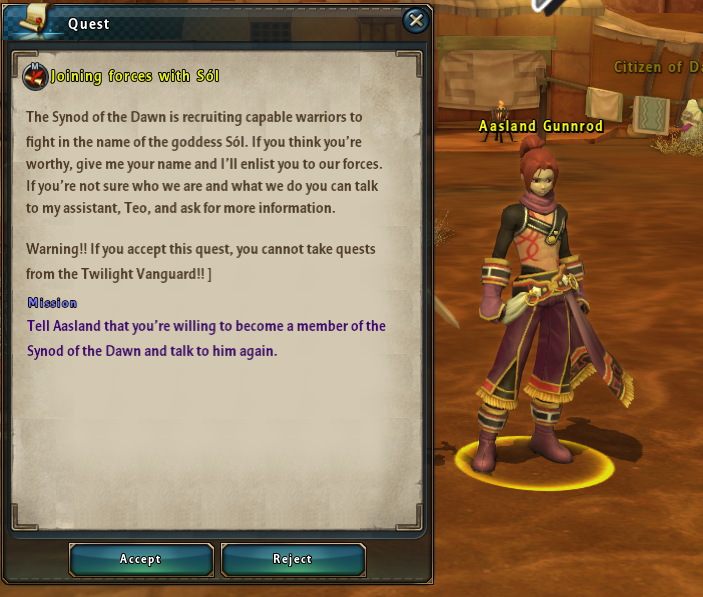 311 years after the Day of Despair, the Synod of The Dawn and the Twilight Vanguard have returned to the Dayr Desert for the first time since their banishment-- and they are recruiting new members. Although the statues of their goddesses have been rendered unrecognizable by the harsh passage of time, their passion and devotion to their goddesses has flourished. The return of the Synod of the Dawn and the Twilight Vanguard marks the beginning of a new adventure for Midgardians. Begin your quest by speaking to Aasland Gunnrod or Simona LeonHart in Dayr Desert. Choose wisely, adventurer. Once you accept the quest of one faction you will not be able to join forces with the other. Which path will you follow? Light or dark? Once you decide, continue on to your first quest! As you start out on your path you will find new quests and Offering Scrolls, and can begin earning Goddesses' Token of Gratitude. Offering Scrolls are Extermination Requests that can be purchased with Zeny or Goddesses' Token of Gratitude. 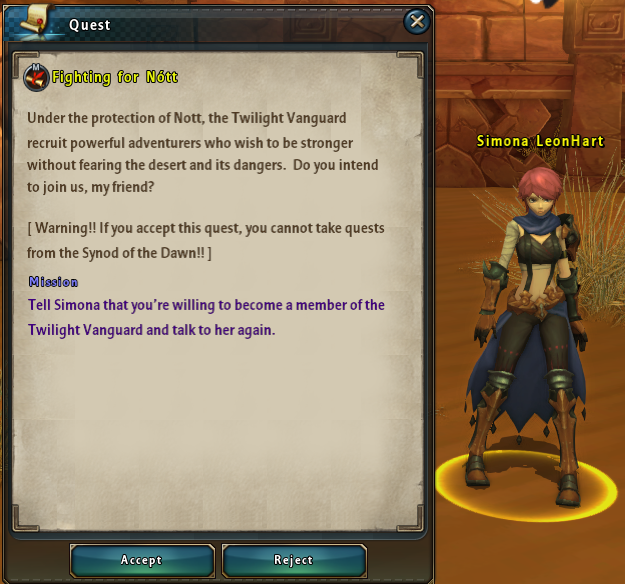 These quests ask you to exterminate certain monsters in exchange for experience and Token rewards. 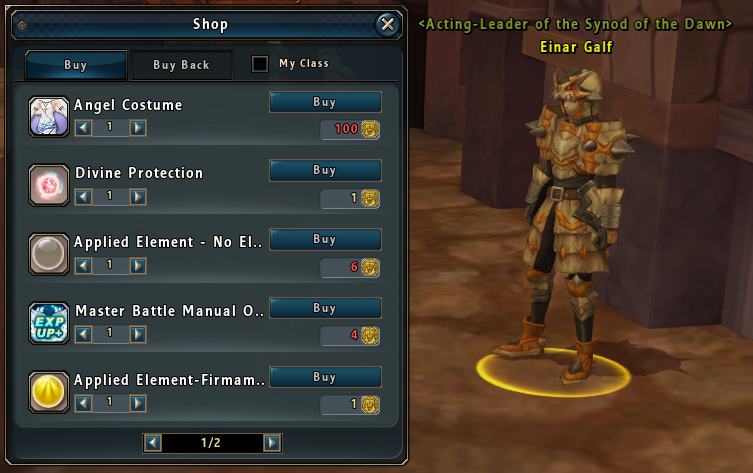 Offering Scroll vendors are located across Dayr Desert, and will be an invaluable addition to your leveling journey. 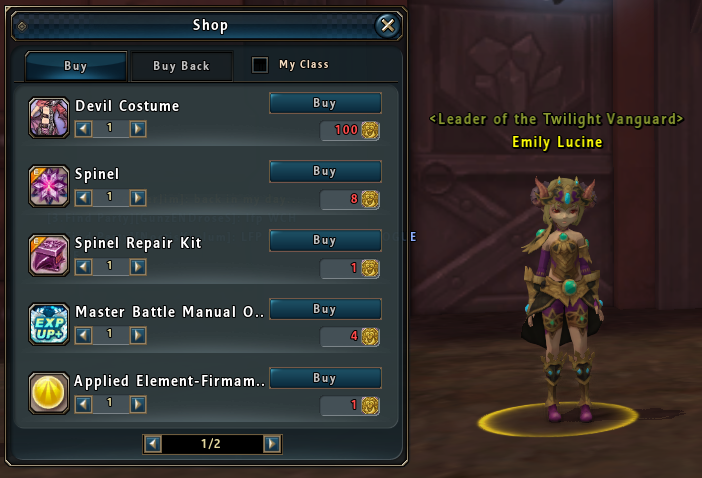 Leader of the Twilight Vanguard, located in the Pilanium Dead Mine. Acting leader of the Synod of the Dawn, located in the Pilanium Dead Mine. Each faction has its own costume and access to special items in addition to the elements. Choose wisely!